This is the new 8 x 10 Acorn Micro Cabin by Forest Trek Woodwork in Alberta, Canada. Our new Acorn cabin is inspired from traditional canvas tents & A frame cabins. The idea is simply a small retreat to escape to from the city. Its made small only have a warm place to sleep & eat and to spend as much time outside as possible. This version is 8ft x 10ft, features pine T&G finished, and Cubic Mini stove. The pentagonal shape of this one is so unique! 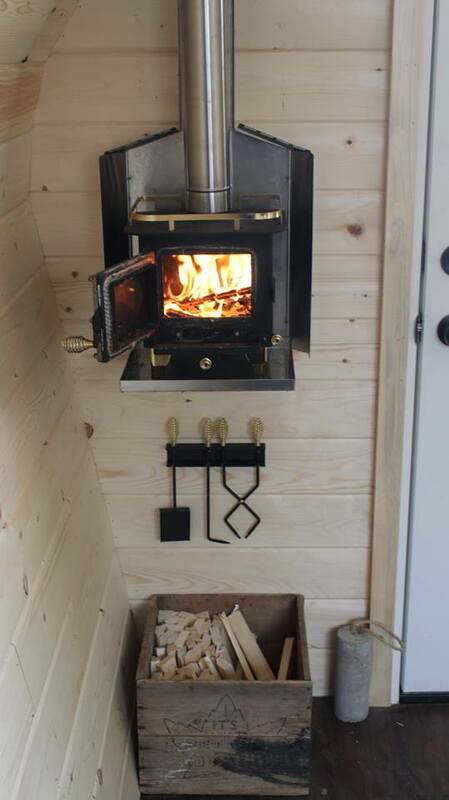 The tiny wood-burning stove! Best thing ever. Here’s a cozy chair, but you could put in a twin bed instead. It even has those cute tiny tools! You can get it directly here. It’s a Cubic Mini Wood Stove. They’re intended for boats, cabins, and RV’s. They have one on Amazon here. Looks easy to drop wherever you need it. Want one? Contact the builder at [email protected] or get a quote here. 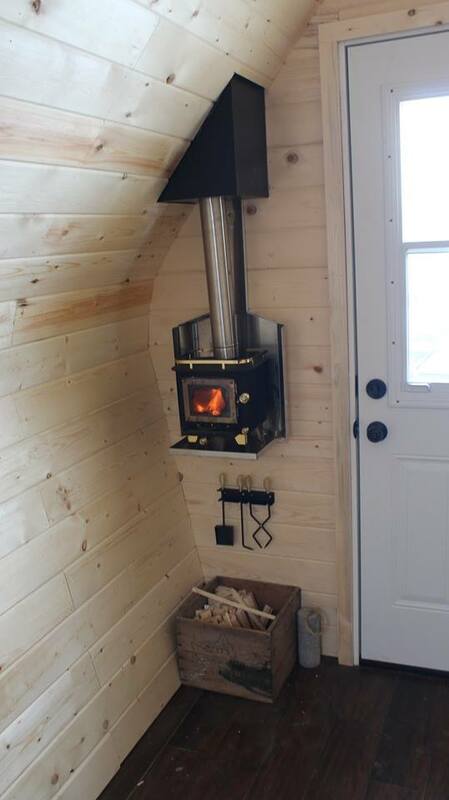 If anybody is curious, the wood stove is a Cubic Mini, from Quebec. https://cubicminiwoodstoves.com/ I have the smaller version, the Cub. Thanks, Alice. I was wondering who made it. Have seen this kind of stove in lots of builds so guessing it is a good one. We have the Cubic Mini Grizzly—the larger of the two sizes they offer—and we LOVE ours. We had it in our 34-foot fifth wheel last year, which is NOT a winter package, and it kept us nice and cozy warm. We had a few weeks of -10 to -20˚F temps (we’re in Montana), and our RV’s heater didn’t kick on until the temp dropped to 10˚F, which is pretty amazing since it runs constant below 32˚F without the Cubic Mini. It does need to be stoked every hour if you’re burning it wide open (which helps keeps the creosote down in the pipe since the stove is so small and doesn’t burn nearly as hot as full-size wood stoves). I seriously can’t say enough good things about this little stove. We are looking for something this size but burns pellets for our 5th wheel we live in. Have you heard of any? How did yours burn pretty clean? I married into an exceptionally LARGE German family. Twenty six to be exact! I always give up the master bedroom to the older generation. I have been wanting a tiny house on our 8 acres so I could have a little retreat when we have guests. They alternate their visits due to the need to run the family business. So, about 10 weeks a year we have an extra 4-6 people in the house. This little micro cabin may be the perfect solution for ME. No more sharing my space with snoring bears! PERFECT! I’d definitely need some AC for GA summers but seriously, I’M IN LOVE WITH THIS PENTAGON SHAPED BEAUTY! Well done! Wow, Melissa, I’m with you. If I had to give up my master bedroom every time people came to visit, and if they visited that often, I’d want my own tiny house too! I would move into it immediately and let the guests have the entire house! I’m from TN and it’s super hot here as well. I think this one is too small for me, BUT as a designer, I could design my own to suit my needs. You have the perfect idea, though! Thanks for the great idea! This is one cute space and perfect for that kind of situation! Did not see any place to eat or sleep unless in a chair. It’s just staged furniture 🙂 You could add whatever you wanted like a twin bed and a side table. Just wondering the tiny heater would this be safe to use in a micro van conversion I.e. using a small van a connect or caddy sort of size if safe in a wooden hut I’m sure it would be but has anyone done this or know of any that have been done as would love details or links.